St Kilda, like all of Melbourne, is a huge cultural melting pot, influenced and inspired by the traditions of countless faraway lands. It’s then little wonder why locals and visitors to the bayside precinct are spoilt for choice when it comes to eating out. To make the decision a little easier for you the next time you’re looking for some exotic fare, we’ve put together a list of cuisine from many corners of the world, brought to the streets of St Kilda by its talented and creative culinary community. While, geographically, the many regions of Europe are a close knit bunch, their cuisine could not be more diverse. The same can be said for European inspired fodder in St Kilda, found in restaurants peppered all over the precinct. If it’s traditional Italian food you’re after, you can’t go past St Kilda stalwart Leo’s Spaghetti Bar, operating in the precinct for over 60 years. 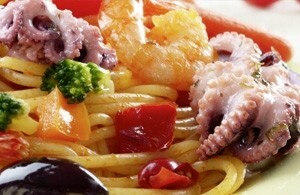 The atmosphere is casual and inviting and the pizza, pasta and seafood is to die for. Cross the Aegean Sea as you cross Fitzroy Street to Kyma, where you’ll find the best Greek food in the precinct. The traditional Mousaka combines eggplant, bolognese and potatoes and is prepared perfectly with béchamel sauce. Mix the best of France and Spain at Fitzroy Street darling, Miss Fitzy’s. Close to the beach, this restaurant and bar oozes sass with its atmosphere and variety of rich, European inspired cuisine. Start off with the acclaimed Roast Duck Melange, finish with a classic French cheese platter and let the champagne flow in between. From noodles to curries to street food, our closest neighbours have it right when it comes to tantalising our tastebuds. 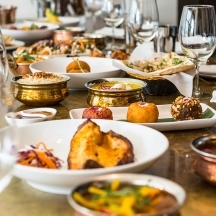 The critically acclaimed Machi restaurant on Inkerman Street is a fantastic place to start when exploring the orient. Boasting some of the best sushi and sake you’ll find in Melbourne, its easy to fall in love with this St Kilda institution. Thai food is a much adored favourite in metropolitan Melbourne and there are a couple of St Kilda hallmarks putting their own spin on it. 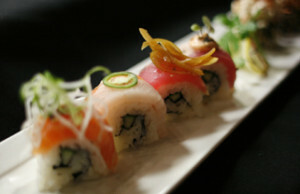 U-Village has paired traditional Thai with scrumptious street food to create their bar and grill. Start off with some satay skewers and move on to the crispy soft shell carb burger. Favourite hangout spot, the Prince Bandroom, now plays home to POW Kitchen, packing a punch with their southern-Asian inspired menu. Here is the perfect place to share a plate of ‘sticky sticky’ short ribs with some friends, paired with Singapore Slings that’ll keep on coming. When thinking about the blends and spices of Asia, we can’t forget our friends from the sub-continent. Babu Ji is the artsy, modern Indian restaurant on Grey Street serving up the spiciest curries and refreshing craft beer. Pair some Dal Almirtsari – slow cooked lentils – with some classic pappadums and, if beer’s not your thing, wind down with a traditional masala spiced chai. It’s becoming somewhat of a Melbourne tradition to pick up a kebab after a late Saturday night. With our love of the Middle Eastern staple, locals can’t seem to go past Casablanca. The bar is nothing fancy but full of character with revellers flocking for flavoured shisha and the variety of tea. This place is known for its perfect felafels, which are hard to come by, so settle in and experience the tastes, smells and atmosphere of Morocco and the Middle East. Things can get pretty spicy in St Kilda, especially with the tastes of Latin America popping up all over town. The day-of-the-dead inspired Acland Street Cantina will have your mouth watering just glancing at their full menu of specialty tacos and Mexican barbeque treats. Personally, we’d like to skip straight to dessert with a cinnamon spiced churros taco, complete with salted caramel ice cream! Latin American fusion restaurant and cocktail bar, United Kitchen, is the perfect place to start a late Saturday night on Fitzroy Street. Catch up over a few cocktails and some edamame before going all-out on some slow-cooked octopus, served with potatoes, spicy chorizo and chimichurri. Sometimes its nice to indulge in some home comforts. There’s plenty of haunts in St Kilda serving up some good, old-fashioned Aussie tucker. The Prince of Wales just keeps on delivering with Circa, the Prince providing modern Australian in three delicious courses, featuring classic seafood and quality wagyu beef. 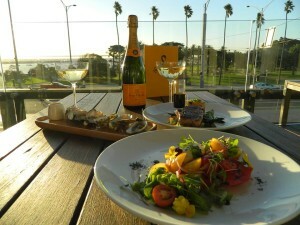 Amongst the iconic St Kilda palm trees sits the stylish Lady Grange, serving its well known oysters into the sunset. A hearty wood-fired pizza might be the perfect way to cap off a great Australian Sunday session here by the bay. You don’t have to go far to travel the globe in St Kilda. The culinary delights of destinations from Morocco to Tokyo are hidden away in this gem of a precinct, just waiting for you explore.